Two figures with outstretched arms will welcome visitors to the Geraldton Regional Art Gallery. City of Greater Geraldton councillors voted 9-3 in favour of the concept design by Perth-based artist April Pine, during the ordinary council meeting on July 24. The sculpture, called Protected Memory, will be located outside the gallery on the grassed area on Durlacher Street. At the close of the exhibition, it was announced two artists had tied for the Allens People’s Choice Prize of $5,000 – WA artist April Pine for her trio of surfers, Trip I, Trip II, Trip III, and Sydney-based artist Marina DeBris for her Inconvenience Store filled with items washed up on the beach. Sydney artist James Dive, who returned to Sculpture by the Sea, Bondi after 11 years when he exhibited the famous melting Mr. Whippy ice cream truck, was awarded the Kids’ Choice Prize of $4,000 for another bright, bold and humorous sculpture, What A Tasty Looking Burger. Such an incredible joy and privilege to be part of the 2017 Bondi Sculpture by the Sea show. Here are some of my favourite Instagram snaps that captured the works in the ever-changing coastline backdrop. April Pine, Pause, Sculpture by the Sea, Cottesloe 2017. Photo Jessica Wyld. 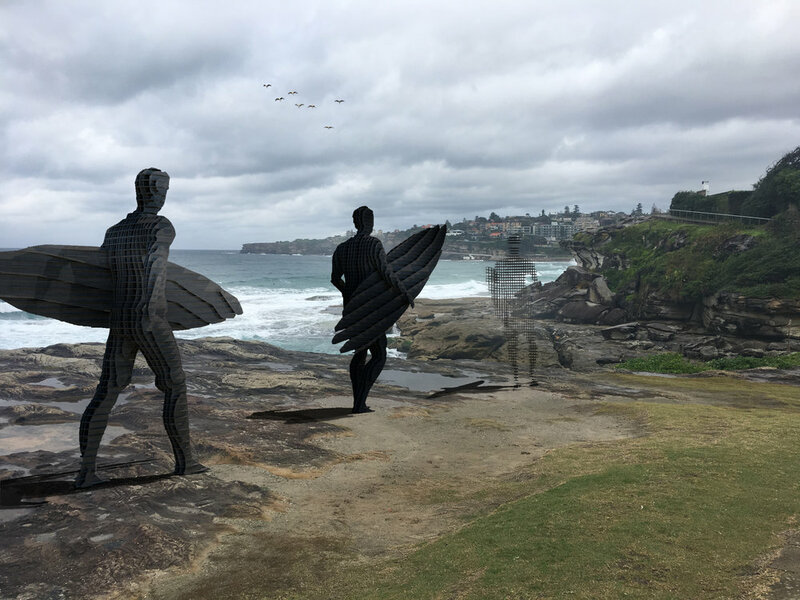 Over the past 21 years a ‘family of sculptors’ has been created by Sculpture by the Sea that has had a major impact on the development of sculpture in Australia. Prominent international and Australian sculptors have provided a legacy of accessible and high order sculpture to a generation of young, emerging sculptors. Sculpture by the Sea has been active in formalising the relationships between established and emerging sculptors through the development and facilitation of a number of programs. One such long-running program, established in 2006, and now in its 12th year, is made possible by the generous support of The Clitheroe Foundation and the Emerging Sculptor Mentor Program. Established with the aim to encourage professional and meaningful fellowships between emerging sculptors and established practitioners, the emerging sculptor receives professional and technical support to ensure development of practice. We are pleased to congratulate the Sculpture by the Sea, Bondi 2017 recipients, who will each receive $10,000 to support their careers, and who now join the sculpture family: collaborators Tango Conway and Amelia Skelton (NSW); Sophie Lanigan and Isobel Lord (NSW); and April Pine (WA). Lucky enough to be a feature artist at Hales 25th Anniversary Fine Art show this weekend. Thank you Kate Leaver for a great write up.